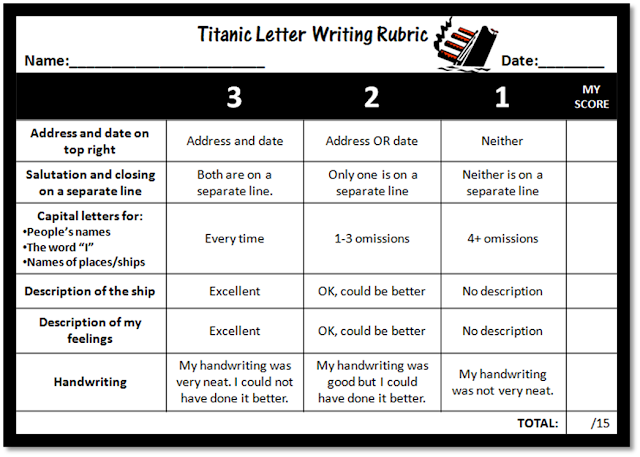 We're doing another class book (where each pupil writes a page) called "Letters from the Titanic." This week has been heavily Titanic-themed so this gives them an opportunity to show off their knowledge. I've pitched them with the scenario that they are passengers on board the Titanic who overheard the captain and ship designer saying that the boat has just hit an iceberg and will crash in less than two hours. They must write a letter to a loved one, telling them about the voyage and explaining their feelings. They will then put it in a bottle and send it out into the Atlantic Ocean. Click on the image below to download the self-assessment rubric that the children will be using to assist them in editing their letters. Just a quick note to anybody downloading this - the total line should read (/18) not (~/15). Apologies!